For Elm trees that are suffering the effects of larval damage, a quick response and treatment can often be the difference between recovery and devastation. 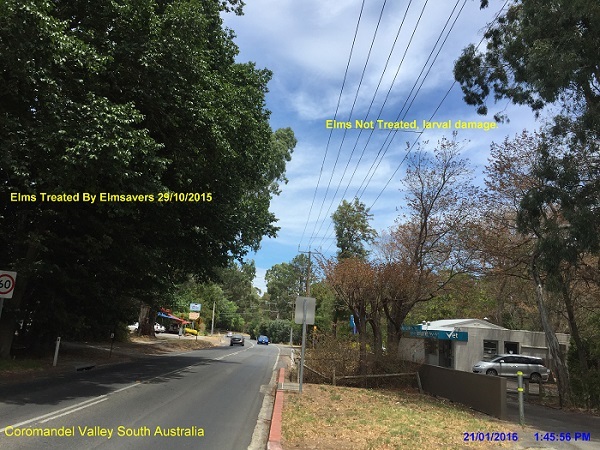 Our success stories from South Australia exhibit this quite well, as Elm trees that underwent our treatment saw results that were almost immediate. In the photo above, you can see an Elm tree that we took care of in Coromandel Valley. The tree underwent treatment at the end of October and is in great health after a rapid recovery. Directly across the street are trees that did not undergo treatment. They are in a condition nearly opposite that of the healthy tree. When it comes to larval damage it’s crucial to seek treatment for your tree in a timely manner. The results are prompt and the risk of further detriment from the affliction can be avoided. Elm leaf beetles inflict their worst damage during the larval stages of their life cycle. If left to their own devices, these beetles will mature and render a tree leafless. It’s possible for beetles to leave a tree completely defoliated in a week if the problem is not addressed. Despite the persistent nature of larva, we’ve found success with our methods. A multi-faceted treatment program can work wonders, even in the most challenging climatic situation. Elmsavers offers multiple options, ensuring suitability of treatment for changing environments. We are experts in treating all stages of the Elm leaf beetle’s lifecycle, and will manage problems related to larval damage with skill and care. To eliminate larva from your Elm tree, fill in our enquiry form or give us a call at 1300 356 728. Previous Previous post: Attention Adelaide Customers!